November 5, 2017 marks one year that Annie Wilson has lived without her beloved husband, Doug. Annie, Organizational Development Specialist at Benefis, and Doug, IT Solutions Analyst at Benefis, found each other later in life and were acutely aware of how fortunate they were to experience such pure love and happiness together. But after just six blissful years, the dreams they’d envisioned for their life together were cut short by Doug’s cancer diagnosis. After enduring 15 months of multiple surgeries, emergency trips to the ER, and at times excruciating pain, Doug Wilson passed away from penile cancer at the age of 52. For the last five weeks of that journey, Doug received care from Benefis Peace Hospice, something Annie considers to be an immeasurable gift. Benefis Peace Hospice gave us peace of mind. 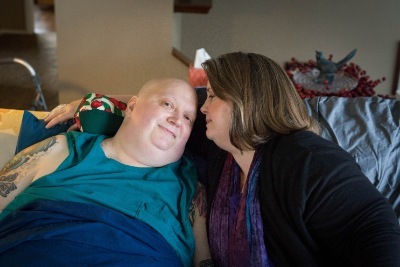 Once Annie and Doug made the decision to stop his cancer treatments and transition into at-home hospice care in late September 2016, they were amazed by the resources made available to them. “We didn’t feel alone at home anymore,” said Annie. Doug immediately received a much-needed, in-home hospital bed—he had been sleeping in a recliner for eight months! The additional specialized physical items and resources they received were a tremendous help, making daily tasks easier for both of them. Annie no longer had to worry about managing Doug’s medical care because they could rely on his nurse, Amanda. Annie explained that when she cared for Doug by herself, she would mask her face and try to hide her fear from him every time she changed a bandage and noticed a tumor had grown. “Amanda’s care was incredible and such a relief. I could text or call her with my questions any time if I needed help,” said Annie. The hospice staff was wonderful and very responsive,” said Annie. “I hit the button, and they were in the room immediately. For the next 10 days at the Residential Facility, Annie could simply be Doug’s wife. Knowing that Annie could finally relinquish her worries was also a comfort for Doug. The hospice care team went above and beyond to make Doug comfortable, even buying malt to make his milkshakes extra special. They provided expert care around the clock until Doug passed away on a Saturday evening. Benefis Peace Hospice helped this loving couple prepare for and accept Doug’s death and lessened the trauma of dying. Annie hopes to inspire others to transition into hospice care early in their end-of-life journey to take full advantage of the comforting services. It is because of the generosity of donors that Benefis Peace Hospice creates a compassionate environment completely free to terminal patients and their families. Thanks to an anonymous gift of $7.1 million, the Peace Hospice Residential Facility was built and opened in July 2002. After a successful fundraising campaign that raised more than $1.57 million, eight rooms were added in 2013, along with an elevator to access the basement. You can help ensure the future of Benefis Peace Hospice with a donation so hospice patients will continue to receive the highest-quality care during their final days.